Opalescence – dazzle with your smile! Do you wonder, what can be done to smile more frequently? If your colleagues’ jokes are no longer funny, it is time to rich for the proven methods. Actually, to have another reason to keep a never-ending smile on your face, it is enough to take care of your teeth by making them white again. This task can be accomplished with Opalescence, a gel of fruity flavour. First of all, stop tearing your hair out when the teeth of yours are not of pure white colour. Bone around tooth root is not 100% white. What is more, discolourations and enamel damages also contribute to changing teeth colour into more yellowish one. Such damages, in turn, are caused by health problems or consumption of particular foods. Generally, there are white, yellow, orange, dark red and brown tooth discolouration distinguished. They are caused, among others, by enamel demineralization, ageing processes of an organism, great huddle of bacteria in oral cavity, caries, tobacco smoking, and overuse of coffee and tea. The plaque that gathers on teeth can be easily removed at private dental practices. The most popular methods of eliminating such ‘coat’ from teeth are scaling and dental sandblasting. Minor discolourations can be whitened by applying appropriate products. How to have beautiful and healthy teeth? Opalescence is a gel containing special teeth whitening substances which can influence comfort of the treatment as well. The preparation reduces or completely eliminates hypersensitivity as well as counteract dehydration of teeth and gum. The level of pH in Opalescence equals 6,5. In general, Opalescence is used for an overnight tooth whitening treatment. Single session should last from 8 to 10 hours. While the treatment is ongoing, there can be developed temporary sensitivity to cold. How does Opalescence work? The ingredients the product is made from cause oxidation reaction, which has its direct impact on tooth whitening. This method is perfect for removing discolourations located on dental arches, individual teeth or just from parts of them. What is worth mentioning, the treatment does not make fillings, veneers and other various types of prosthetic restoration whiter. For that very reason, it is advisable to make teeth white first, and then proceed with masking all possible dental defects. How to use Opalescence? If we want to make our teeth brighter due to overlay method, we have to visit a dentist first. Such a specialist will do a plaster print of our teeth to make overlays afterwards. Once the overlays are ready, the patient gets Opalescence. In short, this tooth-whitening product has to be applied into the overlays that are put on teeth. The first effects are noticeable just after one use. The complete course of the treatment lasts approximately one week. 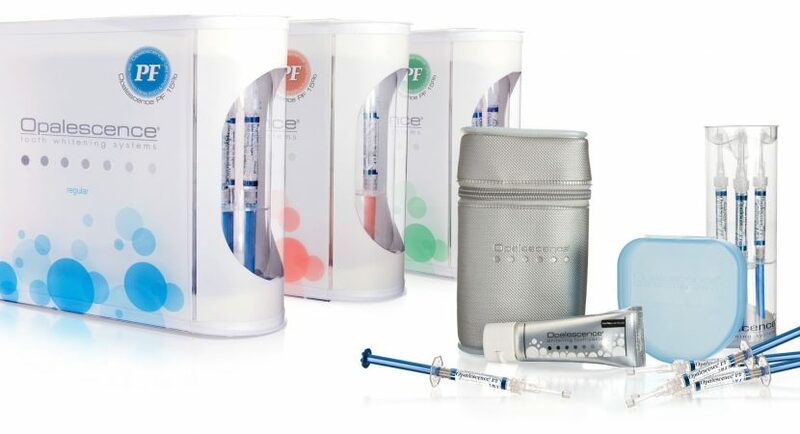 Opalescence set contains 4 syringes containing 1,2 ml of the product each.